There are 2 types of test taking strategies. The one that I get asked about frequently is the one you must avoid teaching explicitly at all costs. The other one addresses the challenges of a cognitive skills test. This article presents both. The three most important strategies we all learned in high school include thoughtful guessing, managing the time, and answering from context. Thoughtful guessing is eliminating 2 choices and picking from the remaining two. Managing time is not spending too much time on the hard questions and saving them to come back to. There are a few more but this is the most you could hope to teach a child. The problem with children is that they don't have enough judgement to exercise either of the first two strategies. At one point a few months before the test, I taught one of my children how to guess. We were well into test prep for the first test, and some of the questions were really hard. I thought guessing might be useful. He understood what I explained. Later, I came back to find most of his answers incorrect. He explained that he guessed on most of them. Despite damage control, this went on for the rest of the month. Guessing is a tool that children aren't ready for. Telling him to skip and come back to a question would be worse because of the unlikelyhood of him coming back to the question. During the test for 1st graders, the test proctors stand there and make sure all the kids are answering the correct questions. I'm not sure skipping is allowed. Imputing the answer from context or looking for clues in the questions may not be appropriate on a cognitive skills test because the questions are 100% context and the test maker is leading the child to the incorrect answer as part of the test, not the other way around. I don't think this really applies here. Unfortunately, on the OLSAT there was at least one question that required the child to eliminate the wrong answers and pick the correct answer which was a word beyond their vocabulary. I'm going to guess that other cognitive skills tests do this. I've been touting Vocabulary Workshop for a long time now but I've haven't been clear on all of the reasons. First, vocabulary is a powerful weapon for the intellect, and it appears to raise IQ scores just by being in the brain. Secondly, these non-verbal tests are shown to be highly susceptible to strong vocabularies. Some researchers seem to think that there's the concept of a non-verbal test doesn't exist. There is even a better reason of all to use a vocabulary book. The reason is that it teaches guessing, time management, and answering from context. (I should try harder not to push a single publisher because I'm not making any money from doing so but Wordly Wise is sterile and I don't trust most workbook publishers because they produce crud. I'm going to switch to Vocabulary Connection 2nd grade this summer because one of my readers mentioned it. I'll report back what I find.). More importantly for a cognitive skills test, my kids now skip back and forth between the questions, the definitions, and the answer set. This is probably the most important skill for the test. What kid wants to wake up to a vocabulary assignment on a Saturday morning? The book starts with pick lists at the first level, and my kids just skip around, do the easy ones, and then fill in the harder ones later. There are many questions with 2 to 4 answers to pick from. They guess from context all of the time, and I've watched their accuracy improve over time even though the words are beginning to be out of reach of their intellects. Vocabulary questions are all about context. Saturday mornings are all about guessing and finishing. My practice on Saturday mornings is to assign the work and then collect it when it's finished. I'm usually cleaning or otherwise busy, and I'll grade it later. I'll circle anything wrong, and by that time, the kids usually know it's the other word they didn't know so they don't have much to do. Since they're already doing extra work, I just let it go if they have a bad day. Plus, mistakes in this house mean learning so no one cares if there are 10 correct or 5. Most of the test strategies that I've taught are designed to break bad habits. The term "bad habits" is generous; the term "dumb habits" would be more accurate because these tendencies below are not associated with academic achievement. Many readers have lamented the struggle with their own children, the seemingly hopeless quest to have them do well on a stinkin' practice test. If you would have sat through a practice test with my kids early on, you would have been sobbing by page 2. The first problem is that some kids might make up their own rules for the test. Analogy and classification questions are the worst. Even going in to the last month, my child was picking the wrong answer to classification questions using this logic: "I pick the Banana because none of the other ones are yellow". The rule is pick the one that doesn't belong because the other 3 are alike in some way. I prayed there was no question with a banana. If you sit with your child on a practice test, go back though the questions together and have him explain his logic so you can make sure he isn't making up rules. The next two problems are that the child runs through the question (or the figure that makes up the question part) too quickly, or picks the first "OK" answer instead of reading all of the answers first and picking the best one. 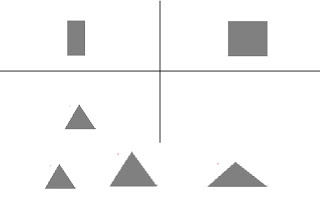 In the case of cognitive ability tests, multiple things can be happening in the question, but the child won't know which one until he surveys all of the answers. Sometimes, he has to go back through the question after not finding his assumed answer to try again. Sometimes what happens is the question is an obvious but unimportant thing, and a subtle but very important thing. A good strategy would be "Read the question, read all of the answers, then read the question before picking the best one". I came up with a little 4 step mantra and made my son memorize it. When the children were called, I heard one mother say "Go do some fun problems!" while I was yelling "Tell me your test taking process one more time." #1 Read the question (which by now he knew what I meant) and #2 look at all of the answers before answering. #3 "If they ask you whether or not you want to continue, demand more test questions." Many parents reported their child was asked this during the test a few years ago, and then we all lived in fear that our child would be weeded out for lack of answering enough questions. This turned out not to be the case for the OLSAT or the COGAT. Nonetheless, we discussed the importance of answering all of the questions. It doesn't matter how these tests are graded. There isn't any room in the the 95% for skipping answers and the there is no time limit. Finally, rule #4: "Don't pick the banana." The COGAT verbal section has Verbal Analogies, Sentence Completion, and a Vocabulary section. I didn't think I had much to report on these sections until I started getting questions from readers. Here is my strategy for these questions. This workbook series is a staple of my At Home Schooling study program, and I first introduced it specifically for test prep. This is not a vocabulary builder, although it helps a lot with vocabulary and over the years I've seen it pay off just for vocabulary. For the test, however, there are too many words to learn (somewhere around 65,000) so it is unlikely to provide an edge unless the COGAT has one of these words, which is extremely unlikely for a variety of reasons. I chose Vocabulary Workshop because it is newer and less boring than Wordly Wise, and my kids use Wordly Wise in school anyway. I haven't tried Vocabulary Connections because Vocabulary Workshop worked so well. The reason I use Vocabulary Workshop is for my kids to be exposed to the nuances of meanings, alternative meanings, and the concept of word choice. These skills don't necessarily come from just reading. The other purpose of Vocabulary Workshop is to be a centerpiece in Test Taking Strategies, which is going to be a separate article. Hopefully, no one is taking the test in the next few months since it is summer so I'll hold off on that article. We do about 2 pages a week, and this pace will get them to the point in a year where they are facing vocabulary way beyond their level, and then I slow down. The centerpiece of preparing for any test, including the COGAT and OLSAT is reading. It is not clear from all of my articles that this is my main focus of not only test prep, but keeping up with school and life in general. Reading is way more important than math. I tend to post mostly about math and logic because this is my competitive advantage and there is way more to discuss. Once you read what I have to say about reading below, I don't have more to say except about every 3 months when we get in trouble with reading and I have to take corrective action. The first thing I do is make a list of all of the books that I want my child to read and all of the books that I'm going to read to my child. Both Reading and Read To are really important activities, and they can take up an hour of each day or more. Everyone knows that they have to read every day. The Read To takes care of itself because that is what bedtime is for. To build the Reading List, depending on where the kids are academically, I will go to the web and get lists of every series that has "Beginning Reader", "Early Reader", etc from all major publishers. Then I'll look up these books on the library website and delete the ones that the library doesn't have. For kids that are actually learning how to read, I make some recommendations on my page on reading (on the right of this blog) that you might find helpful. There are some great series out there, but most of them are not leveled well. For the Read To list, I search for Illustrator awards, and write down all of these books, crossing out the ones that the library doesn't have. Once you find an award winning illustrator, you can query the books that this person has illustrated, and many of these can go on the reading list as well, especially for older kids. With these lists in mind, each week I check out and place holds on a dozen books. Once I get the books, I return the ones that are too hard and put the book titles at the end of the list for later. Eventually they won't be too hard. With a stack of books, I'm ready to assign reading and have my Read To books for each night. Maybe I have 6 that are appropriate for the week, and that is what we do. With little kids learning to ready, their reading probably involves the parent. Maybe they can only read one word or one sentence in the whole book. Maybe we read them over and over throughout the week. Certainly the Read To books - the good ones - get read over and over and over. A good phonics series is great for Test Prep, because it will expose your child to lots of vocabulary very early. You may have to provide the definitions. Plus, it will help them learn to read, and then they'll read more earlier, and early reading is probably the single biggest factor in passing the test and doing well in school forever. Here we are with the older child in the summer after 4th grade. I am putting together a special reading list. I start with award winning books for older kids (typically 6th grade) - I think the Newberry is perfect - and then I search Amazon for these books to make sure they have teacher guides. If there are lots of teacher guides and study guides, then I have my book. When I assign these, I'm specifically asking my child to report to me what is interesting, tricky, surprising, foreboding, confusing. I'm treating these books in the same way I treat a good test question. Don't just read it. Find the mystery. What, it's not a mystery you say? Every well written book is a mystery to be solved. It's time to read slower and think more. Can Your Child Pass The Test With No Reading? The answer is yes, it is possible. The test is trying to find the kids with advanced critical thinking skills who might not even speak English well, let alone read. It turns out that lots of reading is the safest and easiest way to get a high score on the test, but there are alternative paths. If your child only needs to score in the 90% to 95% to get in a GAT program, and you only have 2 months to prepare, you can bypass reading if you work really really hard in the other areas. I have made progress in my quest for the perfect math workbook to teach thinking skills and am prepared to make a recommendation. Many of you with kids beyond 1st grade have complained about the paucity of test prep material. First, I found Eureka on the Engage New York web site. It turns out all of the material is free, but teachers complained about having to do so much printing so a publisher is creating books. Here is a sample lesson (pdf at bottom of their page) for 3rd grade. If you google Eureka you'll find a site that makes you register to print the same material so don't go there. The course appears to be exactly like I teach my kids when they are learning to solve problems, and how I teach my little one new and advanced topics. The material teaches the problems solving methods (with the exception advanced methods) It makes kids do all of the work and gives the teacher prompts and questions to ask. The goal is an understanding of mathematics. Their heart is in the right place, but it would be a perfect math course for a large school district or the inner city. If you are aspiring to get your kid into a GAT program or keep him there, then this is not going to help unless you don't know how to teach math and are tutoring your child, in which case you can peruse the material for ideas. My idea of mathematics is to teach the kids to think and once they know how to think, they can teach themselves math. Next, I found the Noetic math competition. This is very interesting to me because the questions are very very hard, require a lot of thinking, but don't use high school math concepts like the SAT practice book. Here is a sample, and here are more samples under the heading "gifted". These questions are really hard. This is very promising, and I'm going to download the 2012 test for at least a few grades even though they charge $7 per grade. As you may recall in my insanity I started using the SAT Test Prep book to teach math. It was really odd in that I don't feel like my son took away any understanding of high school math; I don't think he could solve the same problem 5 minutes after we did it together if I erased the answer. Some of it was incredibly tricky and he could do it if it didn't involve 2 quadratic equations with 2 unknowns. But he went from the 50% in reading a question to the 99th percentile in 2 months. I am reluctant to recommend this approach because you have to be in the 99th percentile of pain tolerance to pull it off. He got some of them right, and some of them were just futile. Did he get anything out of it? Here's the result. I downloaded a copy of the Massachusetts middle school math competition exam from this year and picked 2 questions that I thought he would get wrong after 45 minutes of struggle. One was very tricky, and the other took me more than a few minutes to figure out. I warned him that the test is timed, and that students have 15 minutes to answer 3 questions, so focus on a good strategy before answering. He got them both correct in less than 2 minutes. I think I'm on to something. The Nordic questions are absolutely perfect for studying for a gifted exam. The questions are so goofy that they're barely math. Between the Nordic questions (working a grade or 2 ahead) and the IMLEM questions, you've got your Test Prep Math workbook. This is what I recommend for the COGAT for after 1st or second grade. You can get past tests and sign up for 10 weekly wacky work problems. Lastly, there's the math league. They have been kind enough to put all of the tests on the web for free. The material looks slightly harder than Nordic, but more math in nature. Use this until I get around to writing my own text book, which will be even harder, but at the pace I'm working your kids will finish law school before I'm finished. For those of you that are as skeptical about our performance on the test, here is the test. I assigned question 2 from category 1 and question 3 from category 6. I'm looking at the rest of the problems and you either have to know obscure math relationships or be a math geek, or be a really good problem solver. We'll see how he does on the rest of the test. Probably will take him more than 5 more minutes. But at least his effort is paying off and I feel like we are focusing on the right things. Last night we went to a play with friends of ours who have 3 super bright kids in a competing GAT program. One of the parents is heavily involved in all things academic and neighborhood, and the other parent teaches math at a great highschool, typically an honors and a non-honors course, plus does some teacher coaching or mentoring. After the play, we went to a local pub to discuss the play and I sat there thinking how much I want to talk about my math education research but can't because a) they both know more than me and b) their kids are smarter than ours and c) my concepts would be really hard to introduce in a classroom with 30 kids. Nonetheless, I found out that Jo Boaler is coming to speak at Evanston High School. You may recall last year that I heard Carol Dweck speak at Evanston High School. All they need after Jo is the Pope. Have you watched sports recently and seen the fans holding up a big picture of their favorite player's head? I'm going to have a big picture of Jo Boaler's head made for the talk and use it to block the view of the people sitting behind me. Now that we're studying for the 4th and 6th grade tests, I need to thwart the competition. Question 5 on the COGAT is the number puzzle. If you prepare your child properly for this question, you are also preparing your child for 1st grade math, to pass the AP exam after senior year, and everything in between. Here is what the question looks like: 3 + ? = 4 + 4. For Kindergarten, the question has pictures instead of numbers, and for older kids it looks more like multi-equation algebra: ? = % + 3 and % = 4. These questions can get super hard, like 8 + ? + ? = 19 - 5. These questions are very similar to number matrices, but unlike number matrices,only one correct answer is possible. Somewhere on this site about 2 years ago, I referenced a research project wherein researchers gave a problem like 3 + 10 = ? - 4 and 95% of 4th grade kids answered "13". The Reading the Question skill is key to all of the COGAT problems. It's 50% of the battle. I've talked about it before. 95% of kids won't see part of this problem. On the test, examples are given to help, but I'm not sure how much. Check The Solution involves a strong number sense. Every Day math teaches this skill explicitly and was it's primary goal. Kumon does this the hard way by over-and-over-and-over solving. The answer set is not really part of the problem because there is only one correct answer. For kids in grades 1 to 4, the Strategy skill is called "Regrouping" and it's fundamental to thinking and fundamental to the COGAT. Most math curriculum teaches number sense and regrouping. Unfortunately, 2 things happen to undo this. First, at some point, kids have to memorize their math facts. The theory is that unless kids can add and multiple, higher order problems are impossible. Secondly, all of the thousands of math problems that a child has to do in the first few years of school are simple and go fast. Bright kids memorize the mat facts early, and that removes the need to think again for the next 3 years. If kids memorize their math facts and can do lots of math problems quickly, they will be a disaster on the COGAT. Even worse, kids are basically told that school is about how well you memorize and how fast you get your work done. In reading, my kids can memorize a whole book in an hour and recite it back 6 months later. But if I ask them "why?" or "what does it mean?" they have no clue, because they don't think. I'd like to drive a bulldozer through the front door of the US Department of Education to let them know how I feel about this situation. If we can't effectively teach our Way Over Privileged children, kids in poor neighborhoods might as well just skip school and go right to jail. With really little kids, teach them arithmetic with blocks, and show them 4 + 2 (blocks). Instead of asking to answer 6, ask them to regroup the blocks and give you a different problem. Then ask for 6. As a bonus you'll be studying for the part of the Number Matrix skills question as well. For kids in 1st through 3rd, get flash cards as usual for the four arithmetic operations. When you show a card with 7 + 9, ask for the regrouping. The kid can respond "6 + 10" or "8 + 8" or "4 + 4 + 4 + 4". It's up to them. No answer is better than another. Sometimes you can suggest ways they haven't considered, but don't push your answer on your kid or you'll undermine their learning. In math, they should be telling you stuff and not the other way around or learning isn't happening. If you are telling them something, it's because you don't want to spend 25 minutes solving a problem, and you are teaching them impatience. For kids in 3rd and 4th grade, be wary of computation. Almost all the problems in good math books and math work books were designed for regrouping. Ask your kids to solve all of the problems in their brains, and if they can't, you have some work to do in the regrouping department. A problem like 22 + 39 should never be solved with "carry the 1" but instead regrouped into 21 + 40. Some 3 digit problems are designed for regrouping, and some just for old calculation methods. Skip the ones that are simply calculation. Regrouping is the stepping stone to algebra. Just thought I'd throw that in if it's not obvious. This question has some of the hallmarks of a good test question. It is multi-step. It is confusing and unfamiliar. It requires a strong working memory with multiple storage buckets. It is also easier than other question types; unlike the number matrix (question 4) and the figure matrix (question 7) there is only one possible answer, and there is nothing vague or confusing about the answer except in one case. This question measures whether or not your child is learning math properly, and thus whether or not your child will succeed in higher math or accelerated math. I recommending spending 10 minutes a day 4 days a week for a kid preparing for the K or 1st grade COGAT. Use flash cards, blocks, and challenging problems as practice. Practice regrouping with a special emphasis on doubles, triples etc for Question 4. If you do really well on this question type, it will make up for your child's deficits in the vocabulary section because you didn't know he was supposed for read chapter books by age 5. How long it takes will vary. If you start at age 3, the first problem with take 115 days. If you start a month before the test, at this age it should go quickly and you'll have less to do, but hopefully your child has an adequate math background. If you start at age 3, on the other hand, your child will be day dreaming during math practice and when you ask him what the heck he is doing he'll respond "I came up with a better solution to Fermat's Last Problem and I was just seeing if I could extend it to the Hodge-Conjecture". If your child is at the 95% level, you don't really need a practice test, unless he needs to get to 99%, in which case you need a practice test, because a practice test is good for 4 points on the test at this level. I don't think a Test Prep Tutor can do this. Not in 30 minutes a week. Workbooks aren't necessary. So again, here's a question type that you can address for free. So far, I've reviewed one of the 3 verbal question types and the first math of the 3 math question types. I've got more to say about math, especially for older kids, but now I'm going to switch to the first of the convoluted shape question types. Question #7 is the figure matrix. I've always thought that this one was the most important. I have no basis for this preference other than if you do a lot of math from a young age because your parent is insane, math should be easy, I gave up on the verbal section at one point, and I thought the figure matrices would be a good candidate for cheating. If you haven't seen the punchline yet, instead of finding a way to cheat we found a way to be smarter. There are quite a few studies that try to teach normal or disadvantaged kids advanced cognitive skills. In each of these studies, the kids cognitive performance goes way way up and then 2 years after the study, it's back to normal. Your child's cognitive ability is a direct result of what your child is doing. Today, I brought my 2 sons, 2 math books, and 2 vocab workshop books to Panera along with my computer. On the way, we passed a dad with 2 little boys in soccer uniforms on the street. These kids are going to be in the top 5% of great guys. But you can't be in the top 5% academically if you spend all of your time acting like the bottom 50%. I'm hoping my kids crack the top 65% of great guys, but that's a problem to be solved later. Also, sports will be an issue to fix later as well. Maybe Stanford's graduate school has a bowling team for the Neurophysics Chemical Engineering Applied Abstract Math Theory Law and Public Policy joint degree program. In the mean time, think about how the top 5% or 1% spends their evening and weekend time. Here is an example figure matrix. The only rule to this problem is whatever happens in the first row has to happen in the second row. This has always been a big challenge with boys and a different type of challenge with girls. Boys go through all 4 stages of loss: Anger, Denial, Crying, and then more Denial. The rule will prove to be counter intuitive and define normal convention for shape changes. You don't see it in the example above, but what if nothing happens? What if the shading changes but there is no answer with a shading change? I've noticed smart little girls struggle in different ways, but I've only worked with a few of them so I can't make a sweeping stereotypical generalization based on gender. It appears to me that girls are too polite. In short, boys are way to bold and get things wrong and girls too timid and get things wrong. Practice material helps a lot because your child can totally screw up the practice test and you can withhold food and water until they follow the rule above. Related to this challenge is the general theme I've talked about repeatedly which is to give each problem plenty of time. Read the question, each of the answers, think about it like a brain teaser. The average kid coming from the US education system will try to rush it and expect to either know the answer or not. A really bright kid who approaches the test like this will get a really bad score. The second problem is that this problem type is vocabulary intensive. It looks like a nonverbal problem and is billed as a nonverbal problem but it is highly verbal. This is primarily an advantage for little kids. By 4th grade, I think the vocabulary advantage will wear off. Look at this problem again. What is the transformation? With a weak vocabulary, the answer is "it got bigger", which is the 2nd choice. This is incorrect. It got wider, which is the 3rd choice. I can get 5th graders on this trick. The Sylvan Kindergarten math book is very verbal and that's why I recommend it. Ideally, you can do this book before Kindergarten and before you start 100% test prep. Here is a list of words I put together to make sure my kid was Vocabulary Ready. Later I found out that you can pack a kid's brain with a ton of vocabulary and knowing these concepts will make the kid smarter (using my usual definition of smart). I took this list from 1st through 3rd grade vocab words focusing on words that I thought we could use. It is very helpful to explain to a young child the concepts of doubling and tripling and quadrupling, and then once your child gets that, halving, cutting in thirds, etc. Use lots of different language for this, use your hands, use paper. This concept plays a minor role in the figure matrices but a helpful role elsewhere. Using shapes to introduce doubling helps when I introduce it quantitatively in a forthcoming article. There are really great ways to trick a child with these matrices. I'm not going to give anything away because a) I've never seen the actual test and b) that would be cheating. If your child sees a problem+solution that is not expected, has a missing element, is usual or not customary, he can react by ignoring the inconsistency and getting it wrong, picking the answer that is usually correct but getting it wrong, or figuring out the trick and picking the logically correct answer. For older kids, rotation versus flipping is a big issue. I'm not sure younger kids will see rotation because little girls haven't developed that skill yet. It probably doesn't appear on the test because the test questions are chosen to put girls and boys on par. So we practiced questions that had the flip/rotation for the 1st grade test because it was hard. My theory is that if you can do something harder than the test, you can do the test. Some of these questions are easy but to get into the 95% to 99%, the child has to master the unexpected, unusual, missing, vague, and inconsistent. It's not about the shapes. It's not about the matrix. It never was. That's the dark secret of the COGAT. So what is it that is unexpected, unusual, or inconsistent? How will your child react? If you've read my last few articles and wonder why I am so big on brain teasers, now you know. All of the gifted sites that I have seen like Hoagies or Davis assume or state that giftedness is inherited and their recommendation for test preparation is a good night sleep. The members of gifted parent forums generally ridicule parents who ask how to prepare for a test, especially forums in the Washington D.C. area. Some of the sites of test prep consulting services flatly state that they can't take a kid at the 50% and make him 95%. That leaves online test prep sites which provide unknown and dubious value, but will charge you for it anyway. We are only 1/3 the way through a review of the test, and now you know that there is a lot you can do besides a good night sleep.